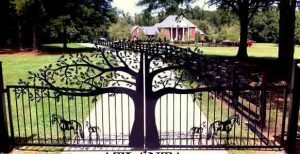 atlanta driveway gates Archives - Custom Driveway Gates - Iron Steel & Aluminum - JDR Metal Art - FREE Standard Shipping! 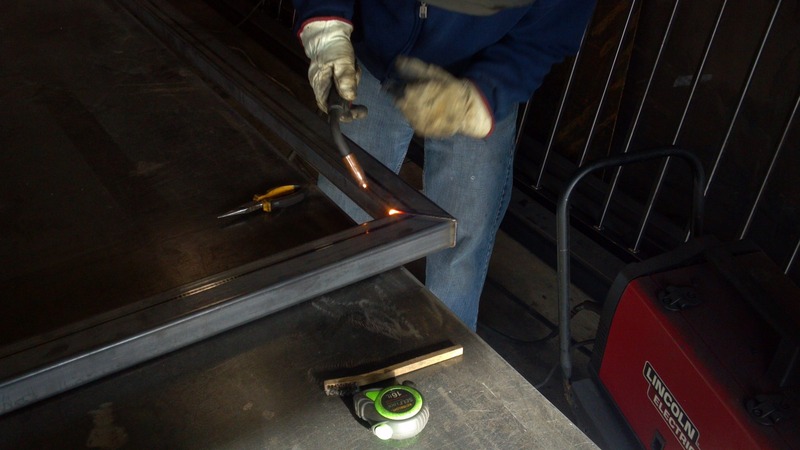 This wrought iron driveway gate project is being put together in Columbus, Ohio and will be shipped to Atlanta, Georgia. 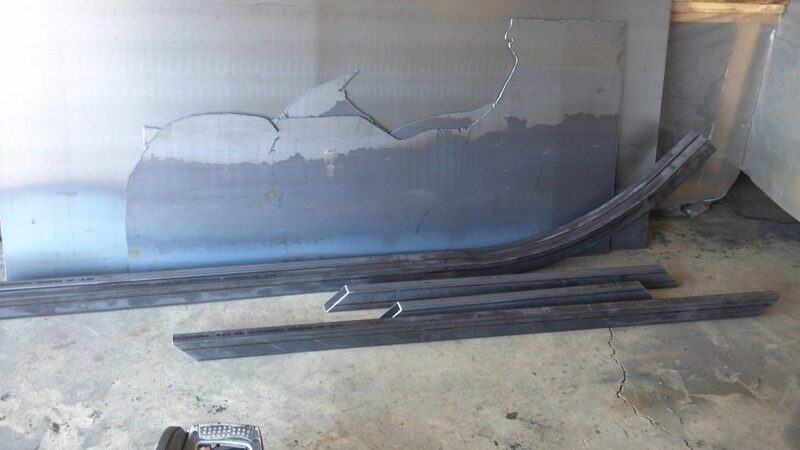 Here is some of the 3×2 steel tubing we are using for the frame. 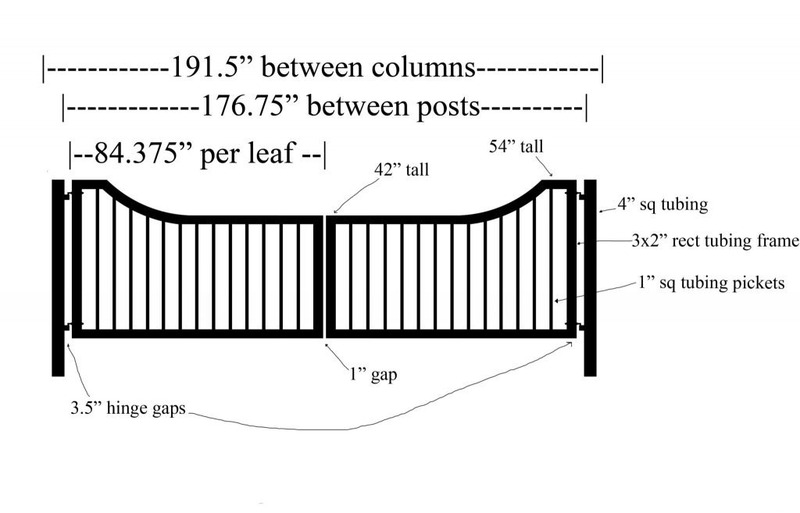 The top rails on each leaf of the gate will arch up at the ends. We will be working from this blueprint which was made by coordinating with the client to determine the needs for his driveway. There will be stone columns going on the side of each gate, but rather than mounting the gates to the columns we have made provisions for the gates to mount to steel posts. Those posts will be set in the areas between the driveway berms and the stone columns. 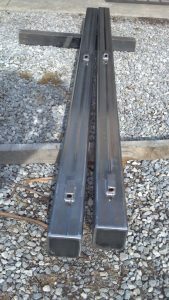 They will attach to the posts using J-bolt hinges with ball bearings and grease fittings. Working on fitting up the arched top together with the hinge side rail. 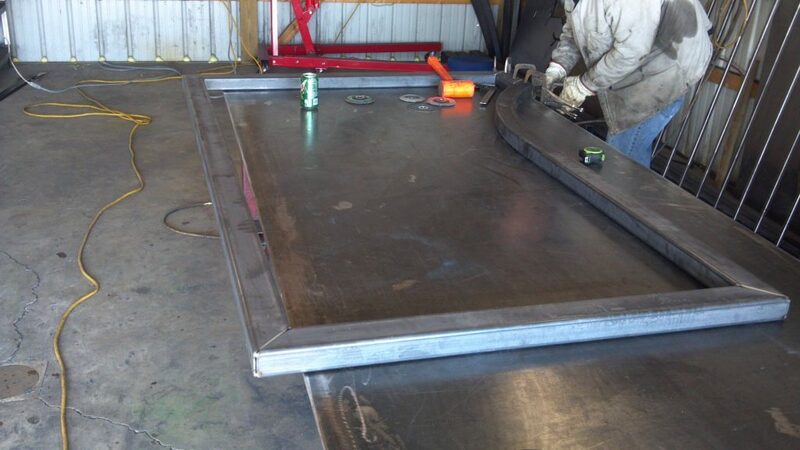 Notice on the bottom of the picture..all joints are mitered with 45 degree ends before being welded together. Takes extra time but makes for a nice and smooth finish. 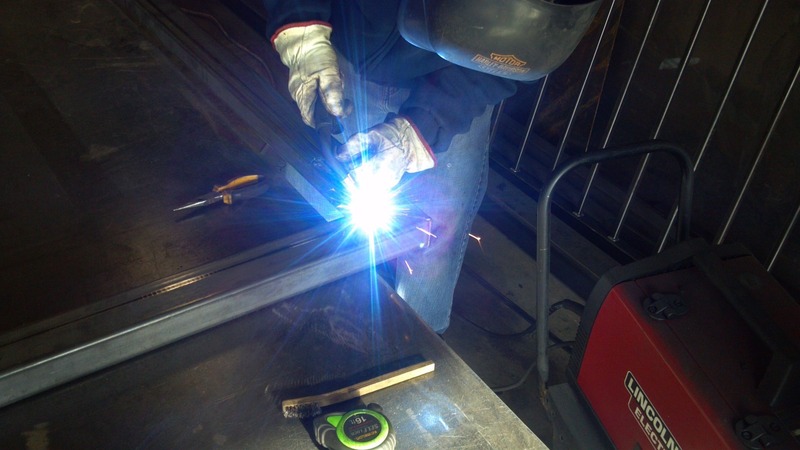 Using a MIG welder to join the gate together at the seams. The welding arc is bright enough to give someone a sunburn! 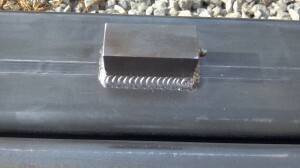 Steel cooling off after running a bead to join a top rail together with a side rail. Shown here in a molten state. 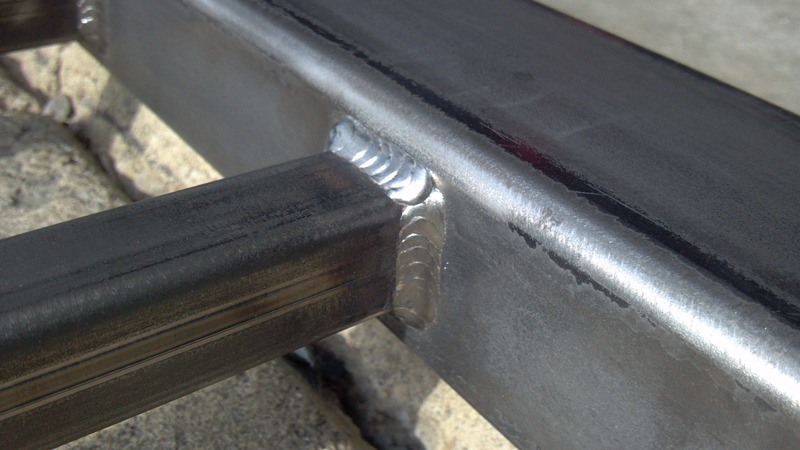 The welds are the strongest part of the gate. Once the metal cools down we take and sand the welds flat. We use a high-gloss paint which tends to show any surface imperfections so we want everything very smooth. All the separate pieces of steel tubing are joined together to become one single beautiful piece of steel that will not sag or fail otherwise. 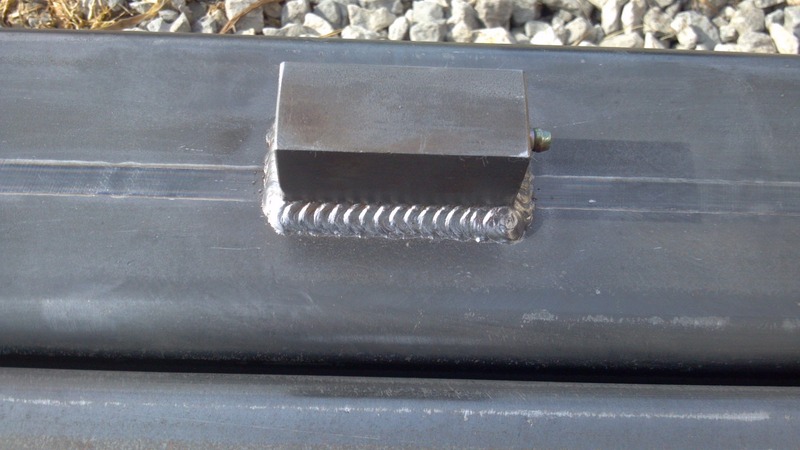 Hinge blocks welded to steel posts…two of them get welded to each post…these take a J-bolt which slips through the hinge rail of the gate and is adjustable with nuts & washers. Picture of the weld joining the square tubing picket to the main rectangular tubing frame. After the client self-installed his gate along with electric openers. It looks like attention was paid to detail on the installation…everything went together perfectly and looks great! 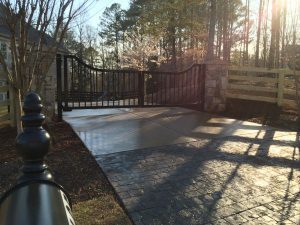 We have worked with numerous clients in the Atlanta area. We are regularly in the area when traveling to install our custom gates nationwide. Here is a set of horse themed Atlanta driveway gates. 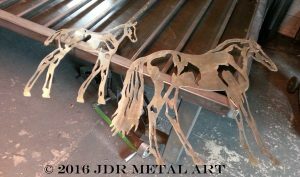 Here is a set of Atlanta gates with a plasma cut metal art tree and horse mare and foal silhouettes. Thank you for taking the time to read this blog post. 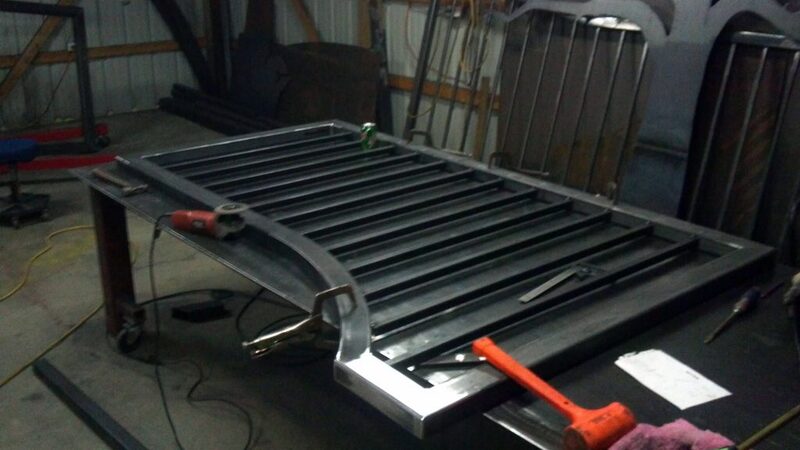 If you happen to need a custom driveway gate, with or without metal art, please contact us to get started today!